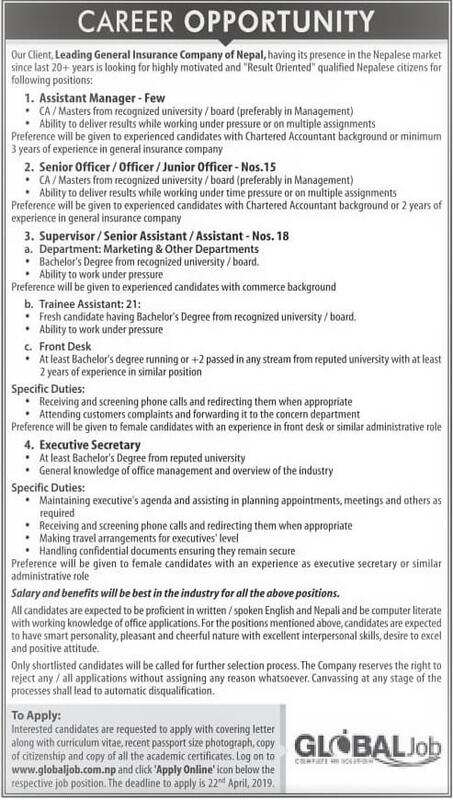 Home / Vacancy / Career Opportunity at General Insurance Company of Nepal. Career Opportunity at General Insurance Company of Nepal. Preference will be given to experienced candidates with commerce background. Fresh candidate having Bachelor's Degree from recognized university/board. Salary and benefits will be best in the industry for all the above positions. Interested candidates are requested to apply with covering letter along with curriculum vitae, recent passport size photograph, a copy of citizenship and copy of all the academic certificates. Log on to www.globaljob.com.np and click 'Apply Online' icon below the respective job position. Application deadline: 22nd April 2019.